sometimes it's really fast and sometimes it's a process. Let's keep it real around here and tell the truth. Christy and I were on a roll with her mudroom and master bedroom. She and her husband approved everything right away. Which is always awesome. But that doesn't happen every time and that's O.K.. 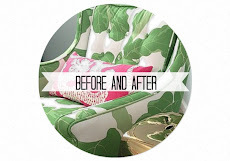 In real life, interior design is a process, and e-design can be the same. Christy and her husband have an amazing home and excellent taste. Their recent renovations have given them so much more space and they were looking for my help with some of the finishing work. for her pillows and windows. 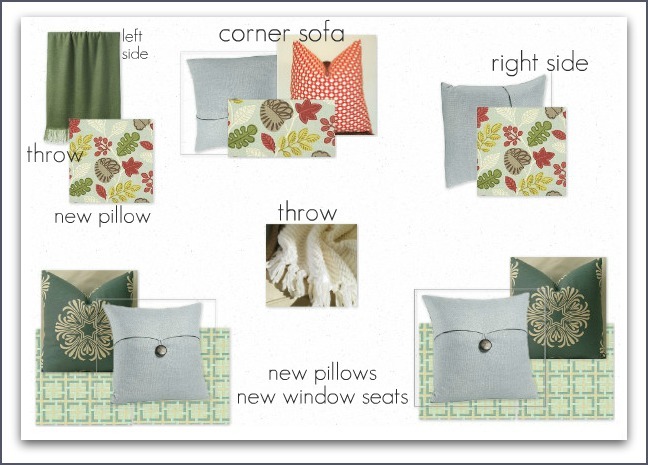 She wanted my help selecting more pillows for the sofa, pillows for the window seat, window seat fabric, a few throws,and two chairs for the chess table. Their plan was to use the game chairs in their dining room for extra seating. Christy has a great eye, so they already owned the white dining chairs. They also needed a side table for the end of their sectional, and a lamp for the left side of their dining room buffet. But they just weren't feeling it...particularly on the window seat fabric. It was a stretch to propose the zebra fabric on the game chairs so they asked for another option on those as well. 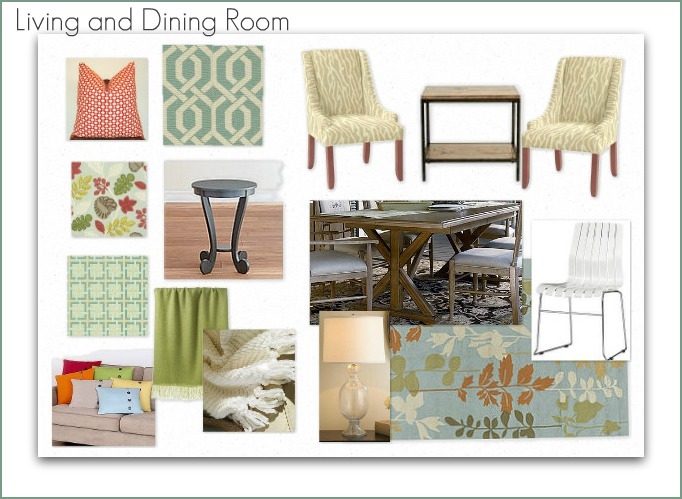 Durability is key to this room, so I chose more indoor/outdoor fabrics. Here's is what we decided on, and I'm thrilled. Can you believe these are outdoor fabrics? I love the tone-on-tone herringbone pattern for the chairs. What do you think? I'm really excited about the plan. If you're considering hiring a designer, just know that it could be super simple and everything clicks with every proposal. Occasionally, you may have to ask for another option. excited with their space. Period. I'm looking forward to the after pictures! Looks like a good working relationship Abby! 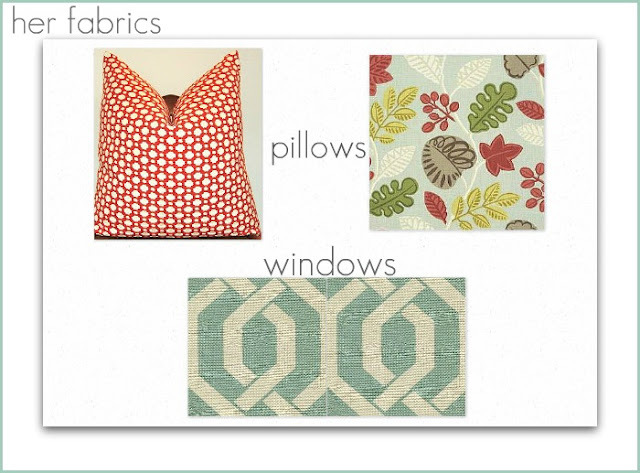 Nice job pulling fabrics together and working to re-think when option #1 was not quite what they wanted. Can't wait to see the finished product! Just curious about the gorgeous print with the leaves...what is it? So funny- I almost posted a similar "design board process" story today, but realized I hadn't asked the client for permission yet. So stay tuned for that! 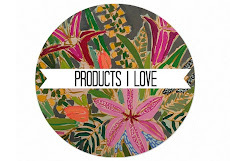 I love having the collaboration--I think we can end up with better products that way. And its weird, because I am such a control freak in other aspects of my life. Always fun to see your projects in the works. I would have gone with the zebra, but I like a little crazy in the mix. ;) THe outdoor fabric will probably wear better though. What a beautiful home to decorate!! I like the idea of indoor/outdoor fabric - I think that makes sense and will be super durable. Do you just keep playing around until you get a combination that works for the client? i.e. did you go back and forth a bunch of times about things or did you propose one plan and then tweek from there? I'm always curious about that part - especially with my own experience last year too. Great question! 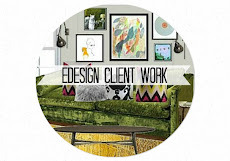 Every client is different. Typically I give one complete plan and then tweak if needed. I take the time to look at many options so if there is a piece they don't like, I usually already have option #2 ready in my mind. 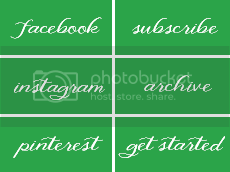 I prefer to not give clients numerous options for ever single piece. Number one, because I'm not a personal shopper, and they're not hiring me for that. Number two, some people get overwhelmed with too many options and that's the whole reason they are paying me-- to come up with a cohesive plan. I hope that answers your question! Thanks for asking. 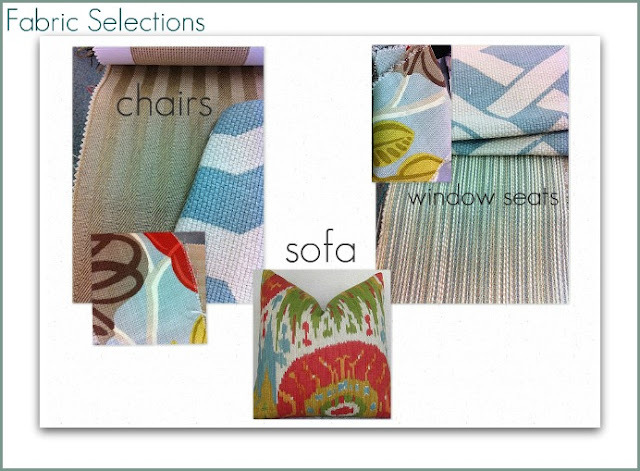 I love the pillow that you chose for the sofa on the final board- the multi colored ikat? Loves! I love all your selections and the cheerful colors! This looks great Abby. I love two points you make. One is that you are not a personal shopper. You are not in the business of lots of options; designers are hired for the best options. And also love the point that it is a process, whether yours or a collaboration with the client. But in the end, the designer can only do what they do best-- present a finite number of things that will work. Love this post!! Abby thanks for sharing your experience with us. 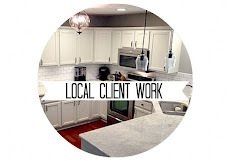 Every client is different. Its true the more options you give them the more they will start to annalize or overthink things and in the end the project will suffer. I can't wait to see the end results. Your plan looks great! Sometimes pillows can be the most challenging. Isn't it funny that they are the smallest piece of the plan and can take so long and give such a huge impact to space? You are right, some projects take longer than others. I love their sofa/console table in the living room! Do you know the manufacturer?